This fear of the unknown hits us right before we take on a new endeavor - like tasting an exotic dish or joining a new workplace. It is, perhaps, a mixture of expectation and doubt that makes the first step seem very monumental. Once the first bite has been taken, the sense of apprehension quickly fades away. For a life-changing situation like a new job though, the sense of foreboding can last well into a month. The change in workflow, a new social sphere to access and your gut instincts might ramp up your perception of the circumstances and leave you overwhelmed. This is just a temporary aspect and should not wreck the opportunities a new job provides. 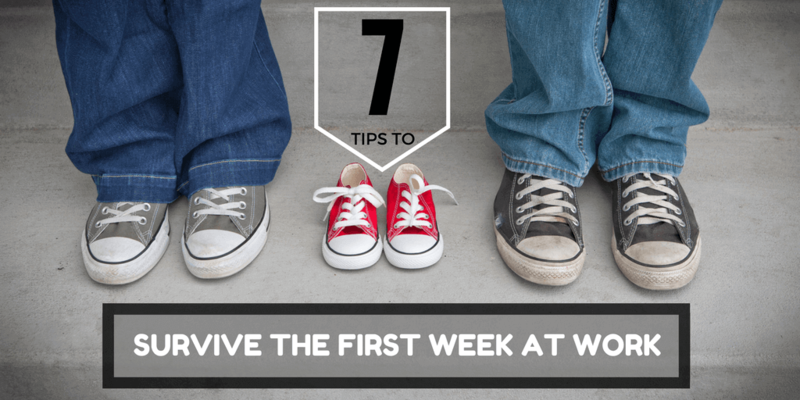 So here are 7 tips to help you ease into your new workplace in the first week of your job. Our brain works in mysterious ways. One reality-shaping activity of the brain is the Pygmalion effect under which higher expectations lead to better outcomes. Studies in Neuroscience have shown that when we expect good things coming our way, the brain rewards itself with a dash of dopamine release(a neurochemical associated with the sensation of pleasure). This means that your projected vision of the new job already causes you to warm up to the place. It’s almost a self-fulfilling prophecy. Expect things to work out well at the new job and your dopamine-induced motivation will ensure they do. This has more to do with your social skills. You are an employee but you are yet to be received as part of the crew. So go out and introduce yourself - to your coworkers, your teammates and the other teams. This might be a whopping task for an introvert but you have to know people besides your boss to settle into the workplace. The best time to do so is in the first week of the job. Every workplace has its own rules regarding inter-departmental communication and instructional hierarchy. Even for non-work related shenanigans, your new job probably has an unspoken code. To quickly adapt to the position, you have to figure out the messaging structure in place. Gone are the days of ringing up a different department and interns carrying stacks of files between desks. Communication apps like Slack or Rocket.chat, collaboration tools like JIRA and team boards like Trello are all now available as digital alternatives to paperwork. Or maybe you could still toss a paper ball for a quick laugh when the boss isn’t looking! What is your task in day-to-day work life? Who does your work serve value to directly? Is it internal (like a different team or the manager) or external ( a customer, an agency or investors)? What are the requirements of those you serve? What resources would you need? Whose work ties in directly with yours? Try not to get overwhelmed by taking on more responsibility than you have handled in the past. That is a sure way to get yourself encumbered in your new job and make it lose its charm. In a new office, a unique culture befitting the idiosyncrasies of your new co-workers is to be expected. To adapt to your position, you should try and get on board with the unwritten rules in place. Remember the tip about leading with an introduction? Well, lunch is a great time for that. It would also give you insight into co-workers with similar taste and interests as yours. Ask for how to work the coffee machine or find a partner for your short afternoon breaks. The sooner you do this, the sooner you would find yourself easing into the job. Even if you are not a conversationalist, social media offers a good alternative to build connections. Reach out to your coworkers on Facebook, Twitter, LinkedIn or Instagram. Take your time away from work to reinforce bonds with the people who strike a chord with you and they would make you feel more welcome in the workplace. This is a very common tip for most situations. But what does it mean? Well, the job interview is where you put forward the best ‘you’ you can be. But now the real job begins. So set your limits while you give the best effort at your duties. Do not burden yourself with work to please the boss and burn yourself out early in the job. Take note when the team members start leaving and aim for some time in the middle to take your leave. The aim is to show that you fit in, not stand out from the team. A new job marks an important change in your life and your goal is to make the transition as smooth as you can. Of course, you are inching towards a better position in your career but that shouldn’t put you under pressure to fill out bigger shoes. That would lead you to the same sense of cosmic dread we get from imagining otherworldly monsters lying under the sea - a fear of situations we are unprepared for. Augustus Franklin is the founder and CEO of CallHub, a California-based Voice and SMS service company. He has worked in internet software, high-availability clusters, monitoring systems and security software at startups and at Sun Microsystems and Yahoo. When he is not working, he is either making toys with his kids or training for a marathon.